A.P.S. Self-Expanding Cork is a pre molded expansion joint filler for concrete, made of granulated cork particles, securely bonded together with an insoluble resin binder. A.P.S. Self-Expanding Cork is specially treated to allow up to 40% expansion beyond its original thickness after installation. A.P.S. Self-Expanding Cork should be used in all concrete joints subject to excessive contraction, as could occur in dams, sewage treatment plants, waste water plants, flood walls, spillways and power plants. A.P.S. Self-Expanding Cork should be installed as detailed on the drawings. Because of a unique treatment used on A.P.S. Expanding Cork, it will not expand prematurely under normal atmospheric conditionals. Thus, unlike many other self-expanding cork materials it can be field cut on the jobsite to the exact size required. The convenient 2' X 3' sheet size makes A.P.S. Self-Expanding Cork easy to handle by field personnel. After installation, if suffecient moisture is not present in the adjacent concrete, clean, cold water should be applied to exposed edges of the cork during the first 48 hours to facilitate expansion. Thickness: 3/8", 1/2", 3/4", 1"
A.P.S. Self-Expanding Cork is wrapped in moisture proof paper. The factory packaging should not be opened until cutting and/or installation is required. Do not expose to rain or moisture after opened. A.P.S. Self-Expanding Cork will not prematurely expand under normal atmospheric conditions. Field installation will not be compromised due to broken pieces with rough edges butted together. 1.) Our easy to handle 2'X3' sheets virtually eliminate broken sheets and therefore provide for a 100% fille concrete joint. 2.) On jobsite cutting enables the contractor to always have on hand the exact size required. Cutting on the jobsite eliminates overbuying of various sizes. 3.) Compatible with most cold and hot applied joint sealants. 4.) Expands up to 140% and compresses up to 50% of its original thickness keeping the joint 100% filled at all times. 5.) Will not prematurely expand under normal atmospheric conditions. The expansion joint filler shall be premolded composed of granulated cork particles, securely bonded together with an insoluble resin binder. The premolded self-expanding cork joint filler should be specially treated to allow up to 40% expansion beyond its original thickness after installation. the self-expanding cork shall have a thickness of not less thatn 140% of its original thickness after immersion in boiling water for one hour. 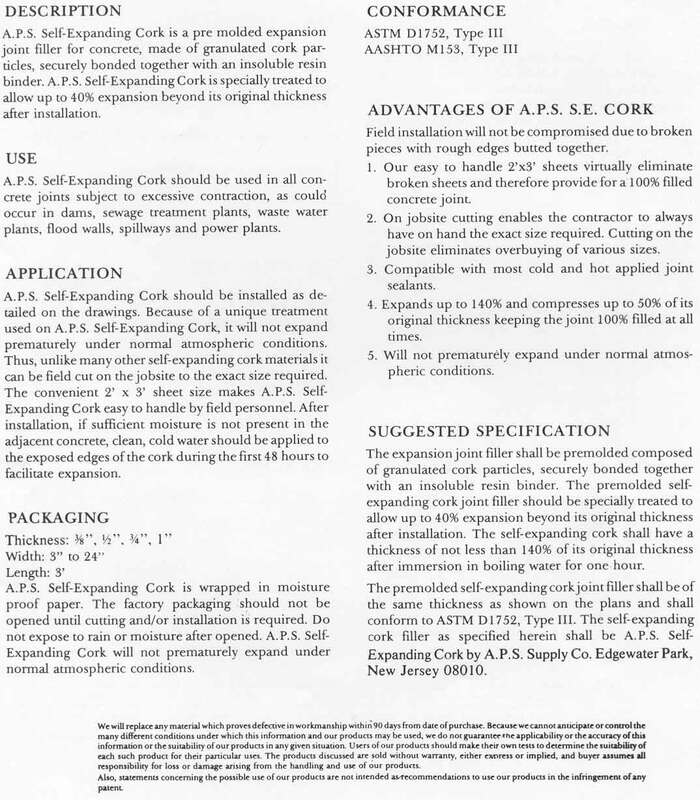 The premolded self-expanding cork joint filler shall be of the same thickness as shown on the plans and shall conform to ASTM D1752, Type III. The self-expanding cork filler as specified herein shall be A.P.S. Self-Expanding Cork by A.P.S. Supply co. Edgewater Park, New Jersey 08010.